Thierry B Fine Art: What Makes Contemporary Aboriginal Art? 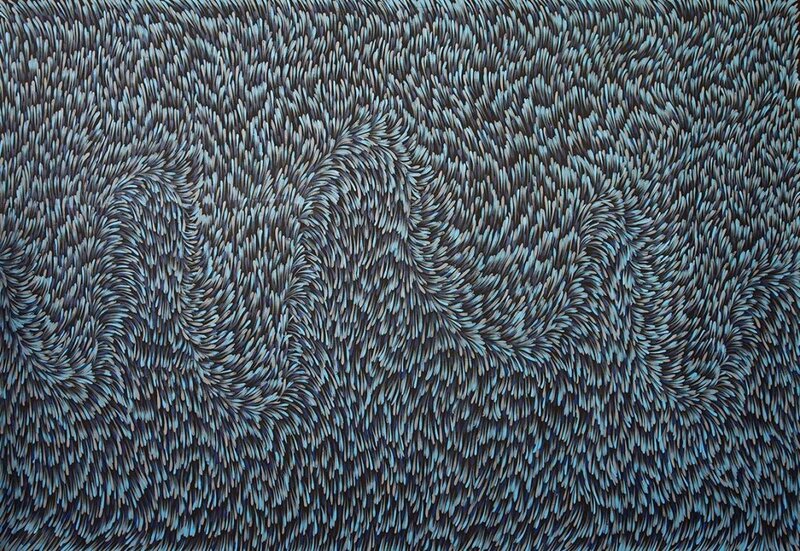 What Makes Contemporary Aboriginal Art ? The contradiction of Aboriginal art is that it is both timeless and contemporary at the same time. This duality challenges the Western understanding of the progress of culture and ideas. Since Aboriginal culture is the oldest continuous living culture in the world , her artwork has existed for 40,000 years and is rooted in the human pre-history. Through songs, rituals, dances, storytelling, symbols and meaningful patterns that are being passed on, Aboriginal groups have managed to preserve their culture for thousands of years. When a group of elder desert men first started to paint their cultural heritage using paper and canvas, that was the birth of the movement that much influenced Aboriginal communities and Australian art in general. For the majority of Westerners, this was the first encounter with Aboriginal culture in general. Having a timeless connection to the pre-history and the first inhabitants of the Australian landscape, Aboriginal art has also been perceived as an innovative and iconic art form inherent to Australia. Gloria Petyarre, Bush Medicine Leaves, Acrylic on Linen, 204 x 139 cm. The first desert works emerged in Papunya in 1971. A white Australian teacher and art worker Geffrey Bardon who was working in a remote community in Central Australia started an art program with children and elder men in the village. When elder men started to translate their knowledge of traditional folklore onto canvas, this was the birth of the contemporary art movement. Soon after, eleven men have formed a cooperative called Papunya Tula Artists, and the movement started to generate a widespread interest across rural and remote Aboriginal Australia. Over subsequent decade as many Aboriginal communities contributed with their specific culture and knowledge, these differences developed into different pictorial languages and regional styles emphisizing their diversity. These initial works that include pieces by now famous Aboriginal artists such as Clifford Possum Tjapaltjarri and Kaapa Tjampitjinpa, are today considered as the foundation of the contemporary Aboriginal art movement and are accounted as very valuable. The art critic and writer Robert Hughes has described the rise of contemporary Australian Aboriginal Art as ‘the latest great art movement of the twentieth century’. 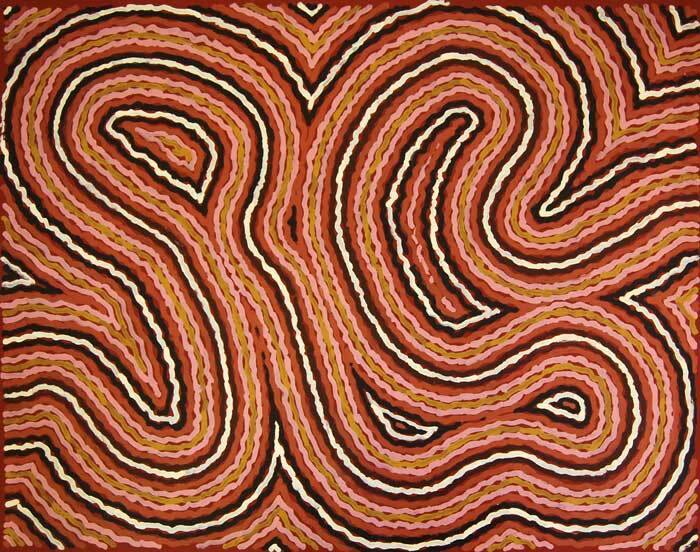 Clifford Possum Tjapaltjarri, Narripi Worm Dreaming, ADG:845, 1997, 125 x 96cm. Since Aborigines didn’t have a history of writing, they have a long tradition of communicating their stories and heritage graphically through symbols. This ancient iconography has transferred into contemporary art works. Often reflecting the spiritual traditions, cultural practices and sociopolitical circumstances of indigenous people, stories and symbols vary widely among the diverse Aboriginal cultures. They range from ones derived from the hunting and tracking background portraying animals and humans with marks they leave or certain clan patterns to aspects of their ‘Dreaming’. The Dreamtime is a translation of the Creation time for Aboriginal people, and it provides their identity and the connection to the land. Artists often need a permission to paint certain traditional stories, and this right is inherited. Sally Gabori, DulkaWarngiid, 2007, Synthetic Polymer Paint on Canvas, 195 x 610cm. Courtesy of National Gallery of Victoria. Contemporary indigenous artists have won many of Australia’s most prominent art prizes not only reserved for indigenous art. Also, Aboriginal artists have represented Australia in the Venice Biennale in 1990 and 1997. Today, Aboriginal art is internationally acclaimed and recognized as fine art. It ranges across a wide variety of mediums from works on paper and canvas to fiber, glass and printmaking. Rooted in traditional iconography, the works are often remarkably modern in design and color. Some of the most prominent names include Clifford Possum Tjapaltjarri, Kaapa Tjampitjinpa, Emily Kngwarreye, Lorna Napurrula Fencer, Christine Napanangka Michaels, Rover Thomas and Gloria Petyarre. There has been a number of Aboriginal artists, such as Michael Cook, William King Jungala or his daughter Sarrita King who have developed a very unique contemporary style combining their Aboriginal heritage with practices and techniques closer to the Western contemporary art. Albert Namatjira, one of the pioneers of Contemporary Aboriginal art, produced western style landscapes different to the traditionalAboriginal art style. On the other hand, there is a number of artists who ethnically and culturally identify as indigenous, but have adopted global art practices and recognizably Western style. Labeling them as Aboriginal artists have caused political controversies and raised questions on conventional notions of what Aboriginal art is. Sarrita King, Ancestors, Jap 010912, Acrylic on Linen, 90 x 60 cm. Sarrita King, Water, Jap-008727, Acrylic on Linen, 230 x 140 cm. It has been widely discussed whether the indigenous art has been commodified by the West and the commercial art world. It has been even suggested that using terms as ‘Aboriginal art’ is intrinsically racistin terms of labeling Aboriginality as ‘other’ compared to the Western norm. Many contemporary artists who happen to be of Aboriginal descent refuse to be categorized and labeled simply for their ethnicity. This issue has gained great publicity when in 1990s Australia’s most renowned international artist Tracey Moffatt refused to present at the exhibition exclusively Aboriginal, and more recently when acclaimed contemporary artist Richard Bell was awarded the National Aboriginal & Torre Strait Islander Art Award in 2003. It seems that it might be the time that the Western community develops a more sophisticated understanding of the diversity of artists of indigenous descent. Emily Kame Kngwarreye, Bush Yam Dreaming, 1994, inscribed verso: #551, Synthetic Polymer Paint on Canvas, 183.0 x 122.0 cm. In 2007, the painting Earth’s Creation by Emily Kngwarreye became the first Aboriginal artwork sold for more than $ 1 million. Her use of dots reaches its crescendo in this phase, with dots merging, separating and dominating in various configurations. They fuse together to create planes of colour structured into mobile shapes, or are choreographed to form lines that suggest dance movements. In earlier works they are used to form fine veils that shield secret markings or create shimmering effects reminiscent of the cosmos. Emily’s palette was largely determined by the changing seasons. Dusty browns appear in her canvases during the dry season, and greens appear after the rains, which Emily referred to as ‘green time’. When wildflowers carpeted the desert, she used a spectrum of yellows. The visual intensity of these paintings recalls the work of French colourists Sonia and Robert Delaunay, or even Claude Monet. Yet Emily knew nothing of their work and, while these French modernists explored pure colour as form and subject, Emily’s only subject throughout her life was her ancestral home of Alhalkere. Emily’s “green-time” canvases attest to an unshakable connection between body and country, one that evades iconography yet demands to be felt. 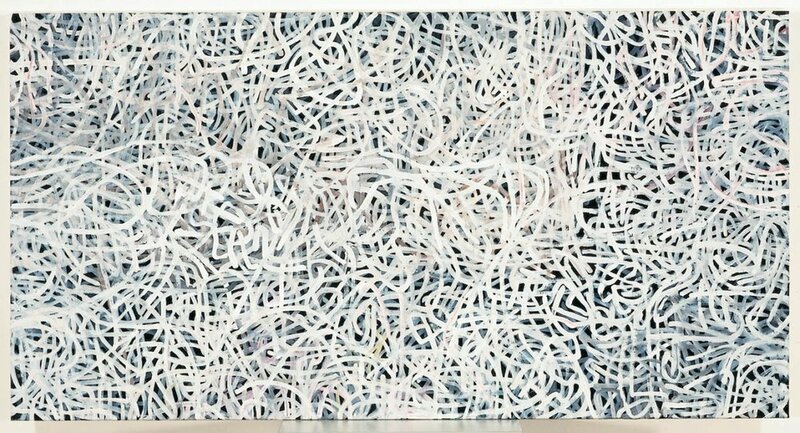 Only a few months after, an epic work Warlugulong by Clifford Possum was sold for $ 2.4 million in Sotheby’s auction in Melbourne. After the initial boom, the market for these works started to struggle due to the issues with authenticity, ownership, exploitation and Australia’s cultural heritage regulation. On the other hand, the first ever sale of Aboriginal art at Sotheby’s London in June 2015 was a huge success showing a sign of renewed interest in this movement. When choosing a piece, the great importance should be placed on the style, medium, status of the artist and age of the artist. With five works being sold for over $100,000, the auction brought in over $ 2 million for 75 lots. As the price of the pieces is rising again, buying Aboriginal art could be a wise investment. Emily Kame Kngwarreye, Bush Yam Dreaming, 1994, inscribed verso: #551, Synthetic Polymer Paint on Canvas, 183.0 x 122.0 cm. Image courtesy of Thierry B.
Thierry B Fine Art proudly offers Aboriginal art and may be viewed in our gallery stockroom. Gallery hours are: Tuesday – Saturday 11am – 5pm, Sunday and Monday closed, or by appointment on : +61 413 675 466.